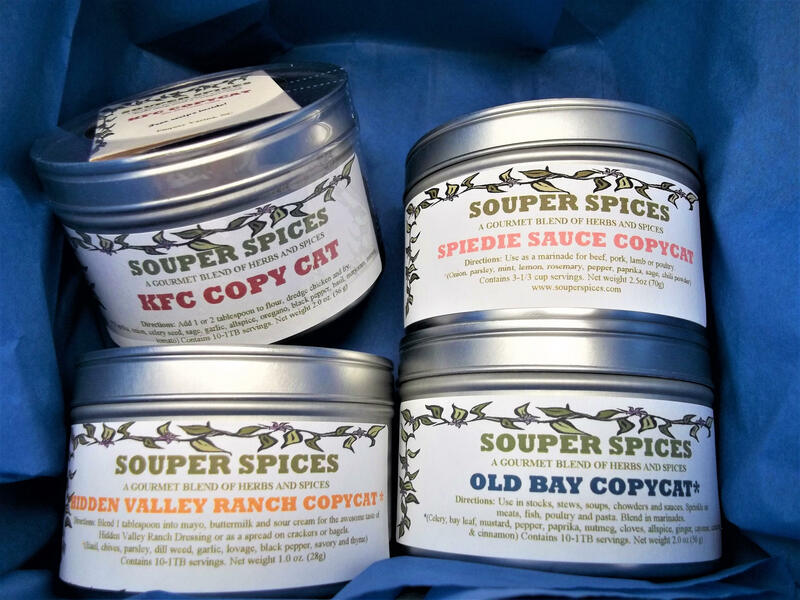 My Souper Spices Copycat gift set is the perfect gift for the person that has everything. It's a deliciously unique gift for friends, families and a great housewarming gift! This is soooo yummy and so much healthier for you than the real thing without sacrificing the savory taste. Also you get to choose how much salt to use. Always season chicken with salt, pepper, and garlic, first. Mix flour, salt and KFC COPYCAT in a baggie and mix well. Dip chicken chunks in buttermilk then in flour mixture. Repeat. Fry in canola oil 2-3 inches deep in a tall pan on medium heat for 6-8 minutes or until golden brown. Finger lick'in good! Try my new "Copycat" and experience the flavor without the bad stuff!! This is extra delicioso with my wonderful Salad Sensations. A blend of pumpkin, sunflower, sesame, flax, poppy, chia and hemps seeds! Use on leafy or pasta salads or blend as a marinade for meats or poultry. Cook pasta according to package directions and drain. Add all ingredients into large bowl. Shake dressing and add entire contents to salad. Toss well. If salad seems dry, add a little more of the oil, vinegar and seasonings. After tossing, salt and pepper to taste. Mamma Mia! 2 Tbsp GOOD SEASONS "COPYCAT"
Place all ingredients in a jar with lid or cruet and shake well. Let stand for at least an hour to incorporate flavors. This can be doubled. *SPIEDIE MARINADE: SPIEDIE* SAUCE "COPYCAT"
Cut meat into 1 cubes. Place into large bowl. Mix all remaining ingredients, and pour marinade over meat. Mix well to coat. Marinate minimum 8 hours, overnight is best, stirring occasionally to ensure even coating. Place meat on skewers. Cook on a grill or under the oven's broiler, no more than 5 inches away from heat source, for about 5 minutes. Turn a few times, brush with marinade while cooking. When meat is done, slide off skewer onto Italian roll or pita. Have you ever had Maryland Crab Cakes? Well, you don't know what you are missing. The secret is the Old Bay seasoning and it isn't the same if it is made with something else. My blend is healthier for you too. (No Salt, Sugar or Caramel Color) We found that there was too much salt in the original which spurred me on to make a "copycat". 1 tsp. Souper Spices Old Bay "Copycat"
In bowl, break bread into small pieces and moisten with milk. Add all remaining ingredients except crab and blend. Pick over crab meat to remove shell particles. Add crab meat to mixture, mixing gently but thoroughly. Shape into six patties and chill 30 minutes. Pan fry in a little butter or oil until brown on each side or broil in oven until browned.